There must never be more than ten flowers. 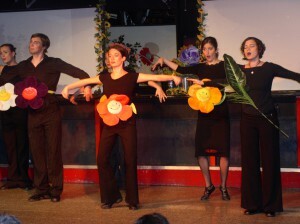 However, it is acceptable to have more than one actor to play a single flower if the costumes are designed to maintain the integrity of each individual flower (for example, one actor plays the flower and another plays the leaves). Additional children can be added to stomp the flowers and trees can be added to the forest to sing along with the flowers. Actors can play the rain and sing the rain song instead of the flowers. Additional text may be added only with permission from the authors or by requesting adjustments from the authors for a specific cast.